At first glance it appeared that NBC's Meredith Vieira and David Gregory, on Friday's Today show, did a decent job of recounting all of the struggles the Obama administration is dealing with from unemployment to foreign policy, but ultimately the pair concluded, in every instance, they weren't actual problems, but merely problems of "perception." First up Vieira mentioned Treasury Secretary Timothy Geithner being criticized on Capitol Hill for 10.2 percent unemployment, something that Gregory wrote off as simply "a perception problem that the administration has to deal with." Then on Obama's recent trip overseas Vieira queried Gregory: "Speaking about perception problems, President Obama just returned from a eight-day trip overseas to Asia. Some critics are saying that it was a failure, more style and no substance. Is that a fair analysis?" To which Gregory responded the Obama team just needed to do a better job of "winning the perception battle." MEREDITH VIEIRA: And now to Washington and the latest on the fight over health care reform. The first key vote on the Senate's bill is now set for tomorrow. David Gregory is the moderator of Meet the Press. David, good morning to you. 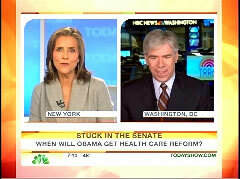 DAVID GREGORY: Good morning, Meredith. VIEIRA: Should be very interesting tomorrow, because in order for this bill to make it through to the next round, all 60 Democrats have to be on board, and right now, that doesn't appear to be the case. There are two moderate Democrats who have yet to say which way they will vote, I'm talking about Louisiana Senator Mary Landrieu and Arkansas Senator Blanche Lincoln. So what does the Majority Leader Harry Reid, need to do to sway these two to at least get some discussion on this bill, some debate on this bill? GREGORY: Well, to be sure, he's sweating a lot. GREGORY: Because remember, this is just the vote to get started on the bill, to get the debate started. But I've been talking to Democratic aides who are reasonably assured, as is Senator Reid, that he does have the votes, that he's got the Democrats together to at least get the process started, to get the debate going. And you're right, they're not gonna get any help from the Republicans on this, but they're pretty confident that they can at least get those wavering Democrats who are not committed to voting for the bill in the end, to at least start the debate. VIEIRA: You know speaking of sweating, I don't know if Treasury Secretary Geithner was sweating yesterday on Capitol Hill, but he certainly was taking a grilling. One congressman Kevin Brady of Texas actually called on him to resign. It doesn't appear that he is gonna do that, but what does it say about the pressure on the Obama administration to start to really turn this economy around? GREGORY: You've got Wall Street doing better than most American workers in this country, you've got 10.2 percent unemployment and a ballooning federal debt. Those are the problems for Secretary Geithner, and he's just the proxy, because those are really the problems for the President. Overall, it's a perception problem that the administration has to deal with. Wall Street gets healthier, the American worker does not. What are they gonna do about the jobs? And all of that frustration on Capitol Hill is really just reflecting frustration in the rest of the country that these lawmakers face when they go home. VIEIRA: Speaking about perception problems, President Obama just returned from a eight-day trip overseas to Asia. Some critics are saying that it was a failure, more subst-, more style and no substance. Is that a fair analysis? GREGORY: Well, the truth is that substantive gains that he wants to make on big issues like Iran, like North Korea, that he's dealing with in Asia, are just not coming about yet. And the relationship with China, in particular is very, very difficult because the United States is coming at it from a position of weakness, because of how much debt the Chinese hold, and they are knowing that they're in that position, not really willing to cooperate on issues like Iran or North Korea or even climate change, and they think that they're in a much different position than the United States. So the administration will make the argument that they're still trying to change the tone, they're trying to lay the foundation for some gains that they'll make down the line. It makes it more difficult, though, in terms of winning the perception battle of these trips. VIEIRA: Alright, David. And very quickly, who have you got coming up on Meet The Press this Sunday? GREGORY: Well, we're gonna be on the health care debate and the war and other big issues like the economy facing the administration, and we'll have a senator showdown. We've got Senators Feinstein, Durbin, Hutchison and Lieberman on the future of the Obama agenda. VIEIRA: Always like a showdown. Thanks very much, David.